Even if you weren’t born during this era, retro brings everyone back to a time where everything was a bit slower, more natural and not to mention, the styles were one-of-a-kind. 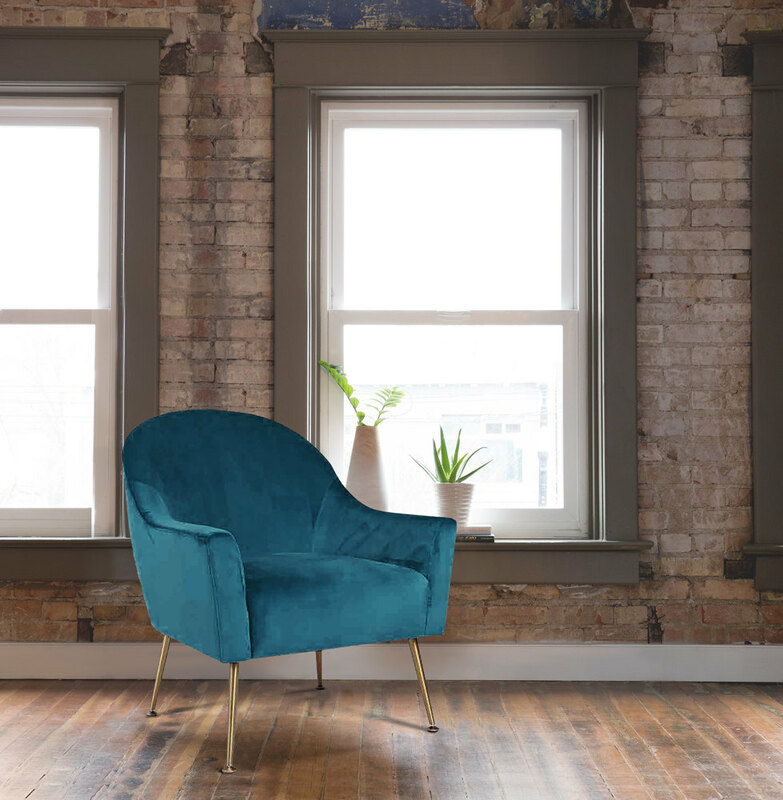 Pick out an item like the Celeste Accent Chair to give your space a pop of colour and that nostalgic flare! All seat cushion cores will soften with normal use and will conform to the shape of the user. This shall be considered normal wear, and shall not be considered a loss of resiliency or a material manufacturing defect. Within one year from the date of purchase, Ashley Furniture Industries, Inc. will replace, for the original retail purchaser only, a cushion core in an unattached (loose) seat cushion (an "Unattached Cushion") that has material manufacturing defects, provided that the original retail purchaser (i) follows the Claim Procedure set forth herein and (ii) returns the defective cushion core contained within an Unattached Cushion to Ashley Furniture Industries, Inc., Attn: Director of Quality at Ashley Furniture Industries, Inc.,One Ashley Way, Arcadia, WI 54612, together with the product serial number and other information required under the Claim Procedure set forth in these Limited Warranties. With respect to a cushion core in a seat cushion which is attached to the product (an "Attached Cushion"), Ashley Furniture Industries, Inc., within one year from the date of purchase, will repair or replace, at its option, for the original retail purchaser only, a cushion core, in an Attached Cushion, which has material manufacturing defects, provided that the original retail purchaser follows the Claim Procedure set forth in these Limited Warranties. With respect to an Attached Cushion, Ashley Furniture Industries, Inc. will pay, within one year from the date of purchase, reasonable and customary labor rates to repair or replace the defective parts and shipping costs from the retailer to and from Ashley Furniture Industries, Inc., or a repair center designated by the Customer Service Department of Ashley Furniture Industries, Inc., at no charge to the original retail purchaser. These Limited Warranties provide coverage to the original retail purchaser and do not apply to rented, business, commercial, institutional, or other non-residential uses. These Limited Warranties do not apply to (i) merchandise that was, at any time, used as a floor sample or display model, (ii) any merchandise purchased "as is" or second-hand, (iii) any merchandise purchased at a distress sale or a going-out-of business sale, or (iv) any merchandise purchased from a liquidator. All warranties, whether express or implied, cover only normal household usage. No warranty, express or implied, applies to any condition resulting from misuse, abuse, delivery or transportation damage, nor any condition resulting from incorrect or inadequate maintenance, cleaning or care. Warranty is null and void if furniture has been moved from original point of delivery to consumer. The Limited Warranties on "Leather", "Upholstered Fabric" and "Finishes and all Other Furniture Products" do not cover (i) damages resulting from excessive soiling, improper or unapproved cleaning methods, (ii) fading or other damages resulting from exposure to sunlight, (iii) damages resulting from household humidity, or (iv) damages resulting from any liquid, including but not limited to alcohol and water. CAUTION: Any use of improper or unapproved cleaning methods voids all warranties of Ashley Furniture Industries, Inc.. IN NO EVENT SHALL ASHLEY FURNITURE INDUSTRIES, INC. BE RESPONSIBLE FOR CONSEQUENTIAL OR INCIDENTAL DAMAGES, SUCH AS LOSS OF USE, INCONVENIENCE, LOSS OR DAMAGE TO PERSONAL PROPERTY, WHETHER INDIRECT OR DIRECT, AND WHETHER ARISING IN CONTRACT OR TORT. IN NO EVENT SHALL ASHLEY FURNITURE INDUSTRIES, INC&apos;S. RESPONSIBILITY EXCEEDS THE PURCHASE PRICE OF THE PRODUCT OR ITS REPLACEMENT. Under these Limited Warranties, Ashley Furniture Industries, Inc.&apos;s exclusive obligation during the applicable warranty period is to repair or replace, at its option, any part or parts found, upon examination by an authorized manufacturer&apos;s representative of Ashley Furniture Industries, Inc., to contain a material manufacturing defect. For all of its products, other than an Unattached Cushion (as defined in the topical heading "Cushioning"), Ashley Furniture Industries, Inc. will pay, within one year from the date of purchase by the original retail purchaser, reasonable and customary labor rates to repair or replace the defective parts and shipping costs from the retailer to and from Ashley Furniture Industries, Inc., or a repair center designated by the Customer Service Department of Ashley Furniture Industries, Inc., at no charge to the original retail purchaser. After one year from the date of purchase, the original retail purchaser will be responsible for labor, packing, and all shipping and transportation costs. If within the warranty period, identical materials are unavailable at the time of repair or replacement, Ashley Furniture Industries, Inc. reserves the right to substitute materials of equal or better quality. Replacement fabrics may vary in color from the original due to dye lot differences. To obtain warranty services for cushioning in seat cushions, the purchaser must comply with the requirements set forth in this warranty under the topical heading of "Cushioning".